On a Dentistry internship in Cambodia with Projects Abroad you will work in the dentistry department of the State Hospital in Phnom Penh and at a private dental clinic. 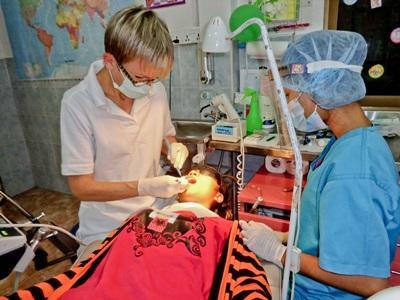 Dentistry interns need to have completed at least 3 years of dental school in order to intern abroad in Cambodia. As with all medical placements your role will usually start by being observational and then your level of responsibility will depend on your level of experience and skill. Showing enthusiasm and initiative and developing a good relationship with the local dental staff is essential and may lead to you gaining a more active role. As an intern you will typically work Monday to Friday from 8am to 12pm. There are some staff who speak English and some will speak French, so an understanding of basic French may also help. While you are in Cambodia you will live in one of our Projects Abroad apartments with other volunteers. You can spend your time experiencing the sites of Phnom Penh with the Projects Abroad volunteer community. While you’re in Cambodia, you might also consider joining a 1 week Culture & Community Project. For more information, please visit our Khmer Project in Cambodia.Our Combinations Page explains how you can combine not only projects, but also destinations.